With the boom of Smart Phones, Internet of things (IoT), Industrial Automations, Smart Home systems etc.. the demand for internet is also growing exponentially. The technology has evolved so much that everything from our car to our refrigerator needs a connection to the internet. This raises other questions like; Will there be enough bandwidth for all these devices? Will these data be secure? Will the existing system be fast enough for all these data? Will there be too much conjunction on network traffic? All these questions will be tackled by this upcoming technology called Li-Fi. So what is LiFi? The term Li-Fi stands for “Light Fidelity”. This is believed to be the next generation of internet, where Light will be used as a medium to transport data. Yes you read it right; it is the same Light that you use in your homes and offices which, with some modifications can be used to transmit data to all your devices that requires internet. What is the existing technology and why do we need a change? There is too demand for the internet that could not met by the current method, which leads to the effect called Spectrum crunch. There is demand for high bandwidth since a higher network speed it required. RF medium is not safe to be used in Hospitals, Power Plants, Aeroplanes etc.. and these places will also need internet connectivity for the modern era. Radio frequency is not safe, since you data can escape through walls and cannot be contained within a particular area. Fun Fact: Did you know that, todays most used wireless internet (WiFi) was actually invented accidentally by Dr John O'Sullivan. He was actually trying to experiment with exploding mini black holes, but it lead to the invention of WiFi in 1991 which now contributes to 60% of global internet traffic. So, yes wherever you have a light bulb you will have an internet connection but here, the term light bulb does not refer to ordinary incandescent lights in our house, these are specially modified LED lights which can transmit data. As we know LED is a semiconductor device and like all semiconductors it has switching properties. This switching property is used to transmit data. The below image explains how a data is transmitted using light. Every LED lamp should be powered through an LED driver, this LED driver will get information from the Internet server and the data will be encoded in the driver. Based on this encoded data the LED lamp will flicker at a very high speed that cannot be noticed by the human eyes. But the Photo Detector on the other end will be able to read all the flickering and this data will be decoded after Amplification and Processing. 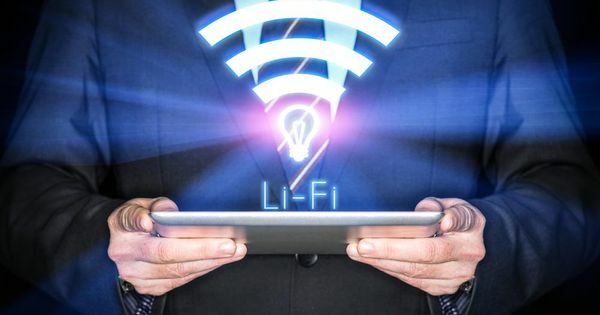 Researchers at Oxford University have tested and pushed the limits of Li-Fi to work with a whooping speed of 224Gbps. To give you an idea, this speed is sufficient to download 10 High definition movies in one second. Dam!.. I am badly waiting to check how fast I would be able to download games with this technology. Yes transmitting data through photo diodes has been happening for a long time through our IR Remotes. Every time we pressed a button on our Television remote the IR LED in the Remote pulses very fast this will be received by the Television and then decoded for the information. But, this old method is very slow and cannot be used to transmit any worthy data. Hence with LiFi this method is made sophisticated by using more than one LED and passing more than one data stream at a given time. This way more information can be passed and hence a faster data communication is possible. How far are we from enjoying Li-Fi? The concept of Li-Fi is not a mere theoretical concept, in fact when Prof. Harald Haas (founder of Li-Fi) introduced the concept of Li-Fi in a TED video he made a practical demonstration by streaming a live HD video to the audience screen and let them dumbstruck by the technology. Ever since then, many brilliant minds have started to contribute and improve the concept of Li-Fi. Today there are companies like Pure LiFi which are ready to offer Li-Fi service for your Home or Office through their Li-Fi dongle which could just be plugged into your laptop USB and read data from any Li-Fi enabled light. So we are not far away from using our reading lamps not only to illuminate or desk but also to Provide internet connection. Hope this article helped you to understand what is Li-Fi and how revolutionary it will be. But if your quench for Li-Fi is trying to push you further to know more about L-Fi, then try to build one on your own. There is a very famous saying by Richard Feynman “What I cannot build, I do not understand” which is one of my personnel favourite. So let us know if we can build a mini Li-Fi on our own to transmit audio signal from one end to other. Before we start let us make it simple that, we are not the first ones to try it. People have already done it so it would not be a complicated process. We just need an Encoder and Decoder part to transmit and receive signal through light. On the receiver side we can use transistors to make a LED light flicker for the input audio signal. This flickering will not be visible to naked eyes since the frequency is high, but when we use a solar panel and analyse its output DC voltage through a scope we will be able to find a patterned variation. This variation is nothing but the audio signal. Simply use an amplifier circuit and a speaker on the output side and you will be able to receive and play the transmitted audio signal. Waooooo this is really stupendous. I will love to know more about this Li Fi technology. And I need more of articles Like this please .